Designer Keld Mikkelsen founded the Day Birger Et Mikkelsen brand in 1997 after spending a decade working in Asia. Inspired by his travels and motivated by years of experience working in the textile industry, Keld Mikkelsen created a clothing collection that combined modern classics, embellished details, exquisite craftsmanship and inventive elements. Today the brand is stocked in over a thousand points of sales in 25 countries around the world. 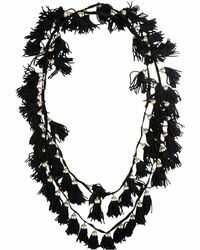 The Day Birger Et Mikkelsen necklace collection offers a contemporary take on everyday couture. Boasting daring colour combinations, angular designs and unusual shapes, this collection reflects the brand's vintage-inspired aesthetic. Stand out from the fashion pack with a chunky embellished necklace or a luxe crystal multi-chain design.